Virginia National Ballet, founded by Elysabeth Muscat and Rafik Hegab, is an exciting, growing dance company in the Mid-Atlantic Region that presents new, original repertoire with talented, award winning international dancers from around the globe. The company is thrilled to announce its Five-Year Anniversary Season, and several new accolades! In 2017-18, the company is presenting a new world premiere with live orchestra, and bringing back the first ballet from our debut season, as well as the annual Nutcracker, and the company’s first tour as part of the Virginia Commission for the Arts Touring Directory for 2017-18, as well as other local events. Additionally, the company is adding five new dancers, for a total of fourteen professional dancers. Soloist Dancer Sakura Oka just won the Bronze Medal in the 2017 World Ballet Competition USA, a highly competitive international competition with the finals taking place in Florida each year. Gainesville Ballet, the official school of Virginia National Ballet, was voted BEST DANCE STUDIO 2017 in Northern Virginia, in Northern Virginia Magazine! 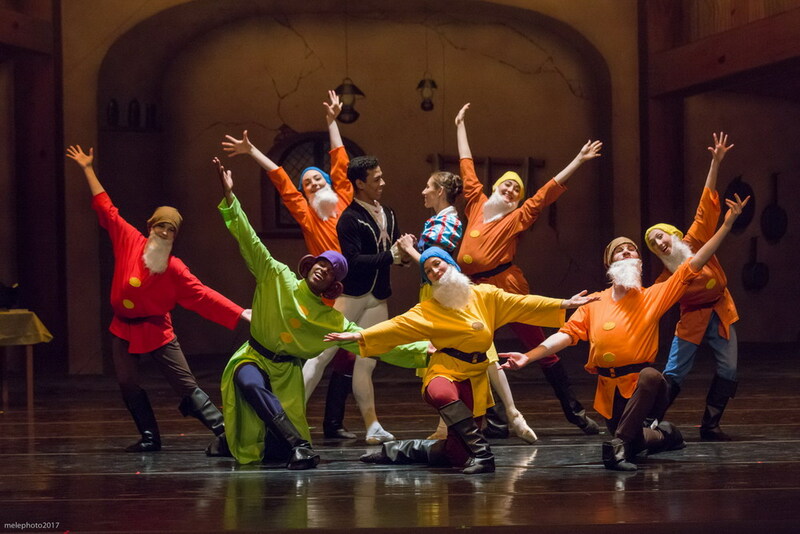 Virginia National Ballet was a finalist again in 2017 for Outstanding Arts Organization by the Seefeldt Awards, and Artistic Director Rafik Hegab was a finalist for Outstanding Individual Artist. He received great reviews on broadwayworld.com, DC Metro Theatre Arts, Inside NOVA, and the Bull Run Observer for his choreography, not only for Virginia National Ballet, but also as a guest choreographer for Young Artists of America’s production of The Circle of Life: The Music of Time Rice, which was televised on PBS. VNB dancers also received wonderful reviews for their dancing and acting. The 2017-18 Five Year Anniversary Season at the Hylton Performing Arts Center begins with The Nutcracker in November 2017, followed by the World Premiere of Aida in February 2018. This is the first time that any ballet company has created a full-length ballet to Verdi’s Aida, which is one of the most popular operas and was also created as a Broadway Musical by Elton John. Mr. Hegab, originally from Egypt, is thrilled to create this new ballet with authentic Egyptian Pharonic elements. Aida is the timeless story of the struggle of two lovers from warring nations who must choose between love or country. This production will be accompanied live by the Old Bridge Chamber Orchestra, and marks the second collaboration with the group, who brought together a 65-piece orchestra for last year’s world premiere of La Bohéme with Virginia National Ballet. In the spring, we are reviving Carmina Burana, the company’s wildly successful debut production from 2014, along with a brand-new version of Ravel’s famous masterpiece, Bolero. The fantastic music of Carmina Burana and Bolero, along with breathtaking choreography and beautiful dancers, is an event not to be missed! Virginia National Ballet will also be touring with this production to Wise, VA, as part of the Pro Art Series in April 2018. The season finishes with a combined presentation with Virginia National Ballet’s official school in June 2018. Other events during the season include Haymarket Day in the Town of Haymarket, the Arts Alive Festival at the Hylton in September, and The Nutcracker Tea at Dominion Valley Country Club in October. With its outstanding, creative Artistic Director, the fresh, young company continues to lead the region with unique repertoire never seen before. Hegab debuted his choreographic skills with Carmina Burana in March 2014 which received standing ovations and rave reviews from audience members, and followed with the ballets Carmen (based on the opera) and Collection in 2015. Carmina Burana was a contemporary ballet with a cast of 25 dancers; Carmen was a neoclassical ballet in a totally original version which included one scene taken from the Bizet opera with live singing, also with cast of 25, and Collection was a group of short dances infusing various styles of music and dance. The 2016-17 season showcased three new world premieres: La Bohéme, Bohemian Rhapsody, and Hegab’s version of Snow White. La Bohéme is based on Puccini’s famous opera, and marks the first time in the US that any ballet company presented a full-length ballet of La Bohéme using an original orchestral score originally commissioned for the West Australian Ballet. Bohemian Rhapsody is a hard rock, contemporary ballet to the music of Queen. Snow White is based on the popular fairy tale and Disney movie, and was a fantastic event for both adults and children. Virginia National Ballet’s company dancers are thoroughly enjoying working with Mr. Hegab. They love the intelligent and unique choices of repertoire, his original choreography, and the wonderful work atmosphere he creates in the studio. The international group includes fourteen dancers (ten women and four men) from the USA, Japan, and Brazil: Saaya Pikula (Japan/Poland), Sakura Oka (Japan), Yuka Yamamoto (Japan), Emily Hashiguchi (Japan/USA), Luiz Gustavo Madubuike (Brazil), Emanuel Tavares Filho (Brazil), Leandro de Almeida (Brazil), and all from the USA: Savanna Alfanos, Annemieke Bruce, Michelle de Angelis, Esmae Gold, Emily Jarrett, Sara Ruesch, Madeline Sosna, and Matthew Waters. Tickets for all Hylton performances are available through their website or at tickets.com.